Whether it’s a beautiful day on the playground or your kids are partaking in a special classroom activity, sharing the moments with students, staff, and parents should be simple and easy with just the touch of a button. With Tadpoles, you can now share videos with parents! Let them witness an exciting day at your daycare or childcare center. Rather than telling them later, show them! Parent involvement has never been better. You can access this feature by starting at the home screen. Touch “share” or slide to the screen to the right. Touch “video” at the bottom on the screen to start and stop recording. Once you are done recording the video, you can share the observation! “Pick kids” to choose the classroom or individual children in the video. Touch "edit notes" to add a caption, select the visibility and type for the observation, and add tags for the child portfolios! You can save the video for later, or touch “send video” and it will be sent to the respective parents. Parents will then receive an email where they can immediately play the video from any browser or mobile device. Sharing a video with parents is fast and simple with Tadpoles! 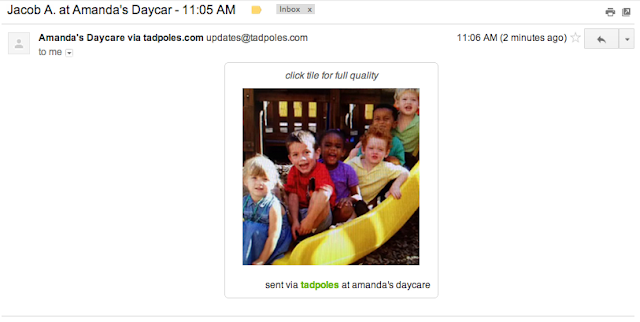 Download the Childcare by Tadpoles application today and try it for yourself!